Heidi H. Hamelin is many things—storyteller, urban gardener, cultural strategist, visual artist and executive advisor. Yet, there’s one overarching theme for this serial hobbyist: her superpower is the ability to see a situation full of chaos and give it purpose, direction and clarity. It’s her penchant for problem-solving and human-centered solutions that has propelled her decade-long career in working with organizations to solve complex challenges and create organizational change. 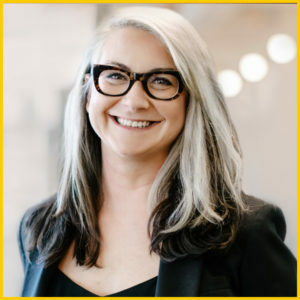 Heidi has worked with well-known brands such as Google, IBM, and Pepsi and currently joins The Design Gym as the Managing Director of Strategy & Business Operations. When Heidi’s not creating a cultural revolution one organization at a time, she’s digging in one of her gardenscapes, failing to keep her dogs off the sofa, or hosting a kickass dinner party.